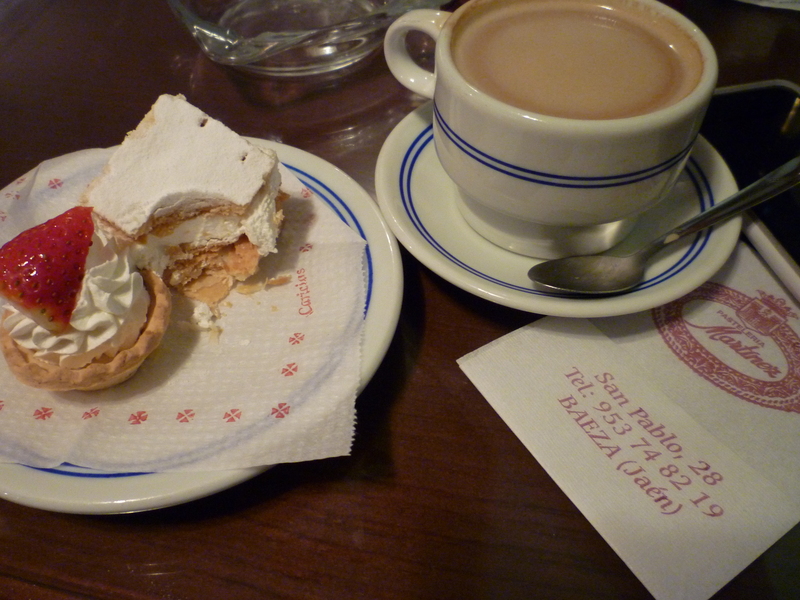 This Baeza institution is an excellent, excellent place to hang out and grab a café con leche and some dainty pasteles. The clientele is Baeza at its finest; all dressed up with nowhere to go—nowhere except here. During peak hours, there is an almost constant stream of older ladies in furs and doll-like toddlers flowing into the warm, two-story café. There is also a healthy population of young Baezanos and well made-up mothers enjoying their afternoon coffee. The bottom level of the café is the main attraction. A golden bar serves coffee, cocktails, and a limited number of cold tapas (though I’ve never tasted any of their savory offerings). Some people stand and take their coffee at the bar, but those who plan to stay a while take a seat at one of the few tables that litter the bottom floor. The upper level houses the majority of the seating in wooden chairs with unexpectedly low tables. I’ve been here with friends and alone, but the atmosphere is definitely a social one, so it’s a better place to come in a chatty group than alone or with a laptop or book. They do have a big basket of old Spanish women’s magazines on the ground floor if you’re taking your coffee solo and looking for some reading material. To the left of the bar is a large glass case showing off my favorite part of the café: their pastries. This is what Martínez is known for, and it’s what keeps me coming back. There are a few normal sized pastries; croissants (good, but very covered in some kind of sugary, apricot-ish preserve, so be ready), bread, and a too-flaky Baezan specialty covered in powdered sugar (which I do not recommend). Then there are the heavenly, colorful, beautiful, bite-sized morsels which I absolutely adore and get every time I come here. They each cost 60 cents and you can get as many or as few as you like, though I recommend a surtido, or selection of 6 on a little gold paper plate if you want to try a nice range. They have everything from cream puffs to little tarts filled with whipped cream and strawberries, to mini rolls of white cake filled with chocolate cream, and they are all very delicious. The tocino de cielo (a sweeter than sweet cousin of flan) is perfect, and looks like a perfectly structured cube of membrillo or flan. To be honest, I don’t really know what any of the pastries actually are and I haven’t cared to ask, but that just means I am delightfully surprised every time I order, and I kind of prefer to keep it that way. The woman at the counter usually is not super friendly and/or is on the phone, but if you wait patiently at the counter, she’ll come and help you sooner or later. Pasteleria Martínez is open 7 days a week (which is amazing!) from 9am to 3pm and then again from 4:30pm to 10pm. It’s busiest in the late afternoon and early morning and if you want the best selection and freshest pastries, come early, as they don’t restock the glass cabinet throughout the day much. You order your drinks and your pastries separately; drinks at the bar, pastries at the pastry counter. Pay for the pastries when you order, but pay for your drinks when you’re done. It’s located at number 28 on c/ San Pablo which is Baeza’s main drag. It’s basically a continuation of Paseo de Constitución so it’s hard to miss. The café is not too well signed but it is located directly across from the old church on San Pablo. Just look for the well-dressed Baezanos and you can’t miss it! Wow. So I am here. In Madrid. No more Baeza, no more La Puerta de Segura, no more teaching, no more Andaluz accents, no more heater-less, hot water-less apartments. And I don’t miss it at all. I moved in with my new family on Saturday. Lorena (the mom) and Bruno (my little charge) met me at Chamartin Station. Thank god they brought a car because I was lugging about 80 pounds of luggage and trying really hard to pretend that it wasn’t too heavy. For about two seconds I was absolutely confused as to how I could have multiplied the weight of my luggage by so much since September–then I realized that I have somehow accumulated 7 pairs of shoes and at least three large-ish jackets since my arrival. This sounds decadent, but when I think about how I only came with one jacket and no boots and how I’ve had to throw out about three pairs of shoes AND how cold and wet it’s been the last four months or so, I don’t feel too bad about it! Also two of the seven pairs were ones I brought back at Christmas and were already owned by moi. Ok, no more defending my closet. I work in the afternoons which basically involves picking up Bruno from the preschool at 4:30pm and walking the 1.7 km back to the apartment. On the way, we stop at the park and I spend the next 1-1.5 hours trying to get him to get back into his stroller while simultaneously pretending to be a monster, pushing him on a swing, and teaching him to count in English. Then, when I finally am victorious and have him strapped down in his stroller, we continue our walk home. He is immediately disappointed upon our return, realizing that his parents are gone, and then we play with trucks and watch Finding Nemo for the next two hours. Dinner is at eight, bath at 8:30, and by nine I am struggling to get him into bed. Tonight, he is magically asleep, but he whimpered, sang, cried, and made truck noises alone in his dark room for 45 minutes after lights out. Tonight was a very, very good night. And that’s it! I am actually exhausted at the end of that, even if I am sitting on a couch watching a movie for half the time. I am supposed to only speak to him in English, but he tunes English out really easily, so I also have to repeat things in Spanish. He has the magic capability that just about every two-year old has to find the sharpest/most breakable object in any room should I leave it for more than .04 seconds, and he is the best fake-tantrum thrower I have ever seen in my life, complete with a full body slam onto a specific spot on the hardwood floor. There is also a dog, which is a French bulldog so I obviously love it, but that dog will hump your leg all day. Then he will lie on your black coat and spread a fine film of black and white hairs over the entire thing. I find this adds to the “look” I have created by losing almost all of the buttons and using safety pins to keep the thing together. CHIC! But seriously, the dog is cute, and if I even pretend to pick up a magazine, it hightails it out of the room. So the problem is easily solved. The city itself is amazing, and I think if Barcelona and New York had a baby, it would definitely be Madrid. It takes me 48 minutes to get to the center on the metro, and I have gone in every day since I’ve been here. I have a heap of podcasts and books and music on my fantastic iPod touch and that keeps me easily occupied for the duration of my journey. I signed up for a Spanish class that only costs 84 euros per month, and so far we have had a test (the first day), corrected said test, anddddd that’s it. I got a 59/103 which is actually better than I thought I would do since I have never learned the subjunctive in my life and I had no idea we were having a test. I think I need to move down a level, but who knows. 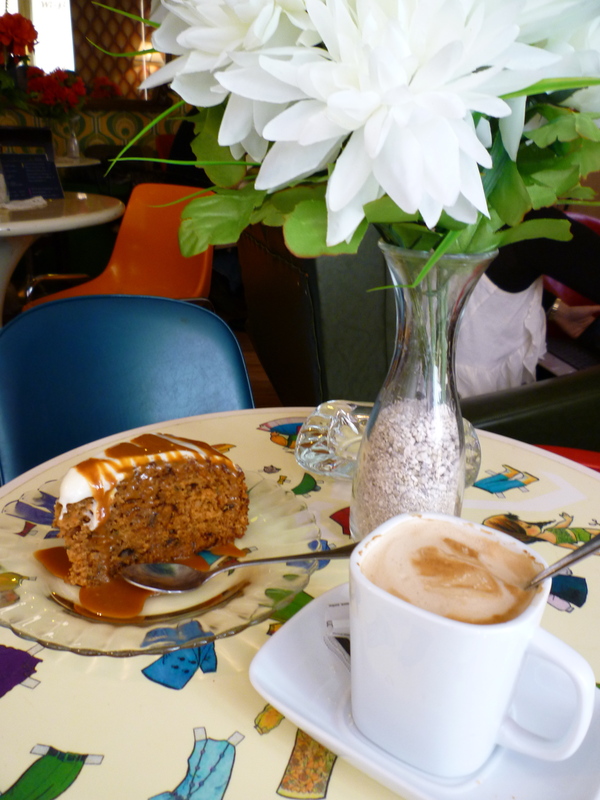 So far I have only met with one mishap, and that involves the delightful cup of coffee and piece of carrot cake in the above photo. Looks good right? It was. It was so so so so good. But it cost 16.50 euros. Well, actually it only cost 6.50, but after paying with a 20 and some coins, I got back a 5 and a 10. Cool. The next day, I go to buy some totally necessary candy with the ten, and the guy just looks at me and says “Es falso.” It’s fake. Aaaand it was. COUNTERFEIT MONEY! It was literally just printed onto regular paper and crumpled up a bunch. I felt like such a sad idiot. But, at least now I have big-city problems! No more near-floods or buses being cancelled and libraries being closed because of the rain. No more “no meat after 2pm” or “we only sell moldy vegetables.” And I don’t know if I can count the fact that I cleaned up dog barf, baby poop, and baby pee all within ten minutes yesterday as a “big city problem,” but honestly, I’ll take it. So far, poop and all, this has been great. One week almost down, 16 to go!